The speed and number of vehicles on the road. The conditions of the road surface (smooth, graveled, dry, wide, narrow, wet, or rough). Pedestrians or bicyclists that are walking on the road edge or crossing the street. The weather conditions (windy, dusty, raining, snowing, or foggy). Not adhering to the set speed limit in a particular area may cause danger to other drivers and pedestrians on the road. It is also subject to harsh penalties and fines for drivers that repeatedly drive over the speed limit. The maximum speed limit that you can drive at will be indicated on most roads, highways and freeways and you should take care in not driving in access of the maximum speed limit indicated. Driving at high speeds minimizes your stopping distance and therefore increases the likelihood of a crash, while the intensity and impact of the collision will also be greater at higher speeds. You should always drive slower in bad weather or heavy traffic and if you fail to obey the speed limit in such circumstances, you will be subject to a driving ticket. When you are driving below the speed limit and another driver wishes to overtake you, always move towards the right hand side. If you are driving a three or more axle truck, a bus or when you are towing a vehicle, you should always drive on the right hand land, or in the lane marked specially for slow vehicles. If there are no lanes marked, you are driving in 4 lanes or more then you should drive on the 2 lanes that are on the right hand side of the road. When you are driving within 500 to 1000 feet of a school, and there are children outside, the designated driving speed is 25 mph. 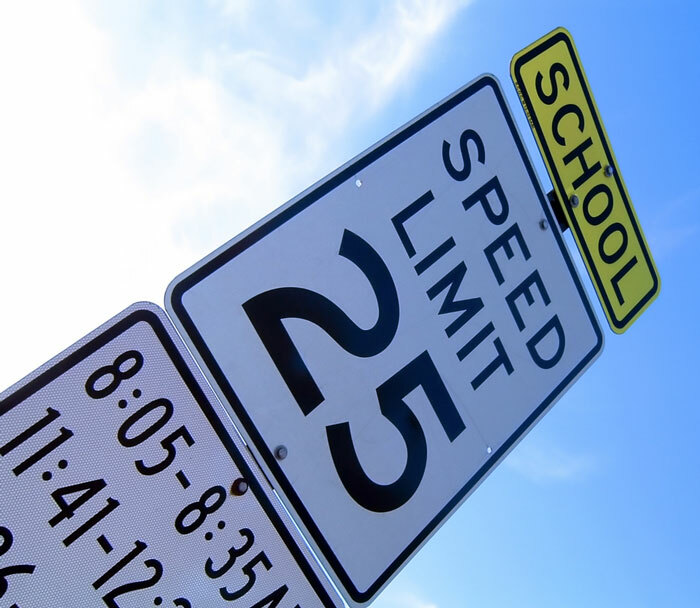 You should never drive over the speed limit in a school zone, and some zones even have speed limits of only 15 mph, since children may be playing or crossing the road in those zones. You should drive below the speed limit when you are near playgrounds, schools, parks and residential areas, since children may run on to the street while playing. Children often haven’t developed the ability to judge distances and speed very well and therefore are at greater risk at getting hit by a fast moving car, which is why greater caution must be practice for them. All vehicles have to stop for school buses with flashing red lights.